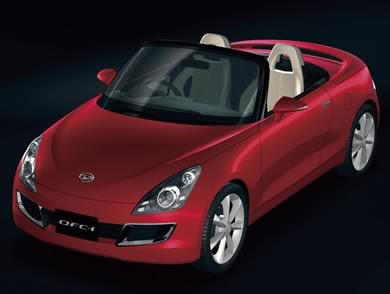 Daihatsu’s OFC-1 Concept is on show at the Frankfurt Motor Show and shows the way forward for a replacement for their Copen micro convertible. 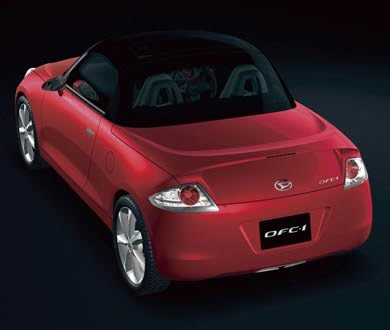 The OFC-1 features a special transparent folding hardtop canopy. The glass used has a liquid crystal sunshade so that the driver can electrically adjust it’s level of transparency to give privacy or an open-air feeling, regardless of the weather. The 3-piece electromotive roof completes operation in less than ten seconds and preserves independent trunk space even when the roof is open to improve the convenience of the compact convertible and allow enough trunk storage space for two adults to take an overnight trip. 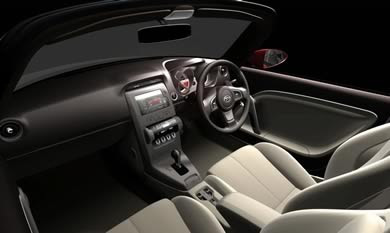 The interior is ‘an expression of the sports mind compressed into a compact space’ and a high-contrast interior color arrangement is intended to provide a progressive, high-quality and sporty interior space. For running performance, the powertrain technology combines a high-performance 658cc 3 cylinder turbo engine together with CVT with 7-speed paddle shift to achieve the highest level of both fuel consumption performance and environmental performance for vehicles in its class. To add to the sporting feel, the vehicle is equipped with 4 wheel disc brakes, electronic modulated suspension and stabilizers to improve roll stiffness. In addition, a rear spoiler melded into the body and the 17-inch alloy wheels, express powerful running performance.